September is recognized as National Preparedness Month, encouraging Americans to take the necessary steps to prepare for emergencies. While we all hope for the best, it’s necessary to also be equipped for the worst. Check out some of the steps that you and your family can take now to make sure you’re protected in the future. Sit down with your family and make sure everyone knows what to do in case of an emergency, both inside and outside the home. For in home emergencies, have a designated meeting place in the event the home must be evacuated. Make sure your kids know where to go for each type of emergency. For example, if there’s an earthquake, they should know where the safest place to drop and cover would be. Create multiple evacuation routes so there are several ways to escape from the house. For emergencies outside of the home, everyone should know the numbers of their family so they can get in touch. You may even want to create a contact card for everyone to carry with them at all times. It’s a good idea to have an out of state emergency contact because they may be easier to reach. 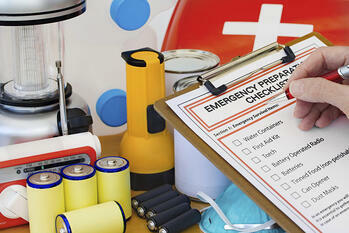 In the event that you are stranded or have to evacuate your home, you need to have an emergency supply kit on hand. This kit should contain enough supplies to last your family for at least three days. Teach your child about the importance of and how to use 911. Although most calls are now traced, it’s important that your child still has your address and phone numbers memorized. To prepare, ask them very direct questions such as ‘what should we do if there’s a fire in the house’ or ‘what if something happens to mom and dad’. It also helps to role play so they know what kind of questions the operator may ask. Teach them to never hang up on 911 until they are told its okay or emergency services arrive. Emphasize that 911 is called ONLY if someone is hurt, there’s a fire, or someone is in the house. It’s not a toy and if they treat it as such, there will be consequences.